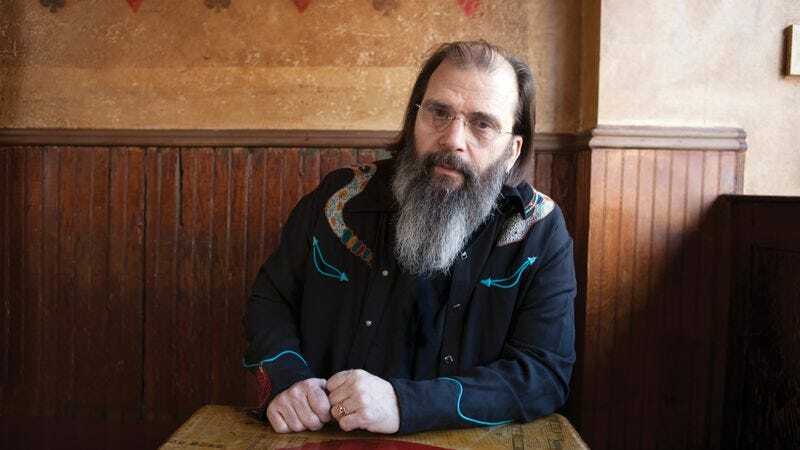 According to legend, the feet of the newborn Steve Earle were placed in a sample of soil that had been shipped from his family’s native Texas. Earle’s father was working in Virginia when Earle was born, and the family wanted the first earth he touched to be Texan. It’s just one of the many tidbits and tales that make up Earle’s colorful life and career as a singer-songwriter, actor, and author. In 1975, at the age of 20, he came this close to having one of his songs recorded by Elvis Presley. (Presley failed to turn up at the studio.) In the ’90s, he served time for narcotics possession. And while his style is rooted in country music, he’s collaborated with everyone from The Pogues to The Supersuckers to Tom Morello—not to mention popping up as a recurring character (and theme-song interpreter) in The Wire. Earle’s latest album, Terraplane, comes out this month, but his body of work stretches back to the ’70s. That’s when the upstart tunesmith hooked up with a gang of songwriters led by the doomed country and folk artist Townes Van Zandt, who would go on to become one of Earle’s biggest inspirations, as well as the subject of an entire tribute album by Earle. His first big splash didn’t come until 1986, when his full-length debut, Guitar Town, became a Grammy-nominated sensation. It hit the top of the country chart, and it fit loosely with a handful of other releases from ’86—Dwight Yoakam’s Guitars, Cadillacs, Etc., Etc., Randy Travis’ Storms Of Life, and Chris Isaak’s self-titled album among them—that revived a twangy, rootsy traditionalism in the country scene. Compared to Guitar Town, 1987’s Exit 0 is cut from a similar cloth. But Earle broke sharply from the pack—even the new traditionalists, with whom he never truly belonged—with the scruffy, ragged Copperhead Road. Released in 1988, the album incorporated bluegrass, hard Southern rock, even Irish folk (courtesy of guest artists The Pogues) that bridged the blown-out distortion of Neil Young’s Crazy Horse and the embryonic alt-country scene that would come to be typified by Uncle Tupelo. Along with the likeminded 1990 album The Hard Way, Copperhead Road also cemented Earle’s storytelling style—an observational, richly imagistic mix of roughhewn character studies and tragicomic grit. Earle’s narcotics addiction culminated in multiple arrests for cocaine and heroin possession, but after imprisonment and rehab, he came back from a five-year hiatus with his 1995 album Train A Comin’. Rather than hardening his sound, his experiences broadened it. The record features raspy yet tender covers of The Beatles and The Melodians as well as subtle, soulful originals that double as confessionals. Country music, at least in the Nashville-centric sense, faded into the background. In its place, a more diverse and integrated sound emerged, one that took an even greater leap forward with 1996’s I Feel Alright. By that point, alt-country was in full swing, and Earle inadvertently installed himself as one of the movement’s godfathers. Raw, rowdy, and stripped to a roots-rock essence that pulled from folk, rockabilly, punk, and all points in between, the album broke from purist traditionalism by embracing a vision of polyglot Americana. His characters grew sharper, his songs punchier and catchier, and his delivery more righteous and more relaxed at the same time. Rock ’n’ roll of the Copperhead Road variety surged back with 1997’s El Corazón. “Taneytown,” with Emmylou Harris on backup vocals, simmers and sears; “N.Y.C.,” backed by The Supersuckers, saunters and squeals. But it took 2000’s Transcendental Blues for Earle to reach his peak. The ambitious album—which features his longtime band The Dukes adventurously exploring every texture and angle in Earle’s toolbox—sports a wide array of instrumentation, including banjo, bodhran, and bouzouki. At times it’s fiercely aggressive; elsewhere it’s droning and atmospheric. Earle would go on to cover Tom Waits’ “Way Down In The Hole” for the opening of season five of The Wire, but on Transcendental Blues, Earle edges close to the fabulist majesty of Waits’ himself—then takes it to another place entirely, one of hard emotional truths and spiritual awakening. While always outspoken, Earle took a turn for the unabashedly political in the wake of 9/11. His Jerusalem release the following year is a concept album that’s alternately plaintive and strident, a tightening and focusing of the sprawl that was evident on Transcendental Blues, steering Earle more toward Bruce Springsteen than Tom Waits; in fact, Jerusalem could serve as more subdued companion piece to Springsteen’s ’02 album, The Rising. It strikes a contemplative balance that was missing from many of 9/11-reaction albums—although Earle looses that balance a bit on 2004’s The Revolution Starts Now. The songs are as pointed as the record’s title; Earle switches from poetic narrator to fist-pumping activist, and the result is a full-blooded, on-the-nose harangue against the ills of the George W. Bush era that suffers somewhat from its shrillness. Over the past few years, Earle has kept his toes dipped in all his various interests, but with mixed results. 2007’s Washington Square Serenade is a grab bag of sounds and narratives that tinkers with loops, features duets with his then-wife Allison Moorer, and tones down the rhetoric, relying more heavily once again on his character sketches and story fragments. Townes, released in 2009, is his album-length tribute to Van Zandt, and he faithfully honors his mentor; 2013’s The Low Highway and the new Terraplane are of a piece, low-key hangout sessions with a stress on intimacy and the blues. His lone full-length collaboration, The Mountain, came out in 1999, aided and abetted by The Del McCoury Band. It’s a solid demonstration of middle-of-the-road bluegrass, even if it feels more like a tangent. The same can be said of Steve Earle & The Supersuckers, a 1997 EP that was spun off from that band’s team-up with Earle on El Corazón. They cover each other then jam with ramshackle on The Rolling Stones’ “Before They Make Me Run.” It’s a novelty, but not much else. More essential—especially for historic reasons—is the 1987 compilation Early Tracks, which gathers formative songs from Earle’s years as an aspiring songwriter, which veer from honky-tonk pastiche to glimpses of depth and maturity to come. Earle’s filmography isn’t staggering, but he’s made his appearances on screen count. His turn as Walon—a markedly Earle-esque former junkie and Narcotics Anonymous sponsor on The Wire—didn’t threaten to rob any of his castmates of an Emmy nomination, but his gravelly delivery has a wise, damaged charm. He appears more briefly on David Simon’s follow-up to The Wire, the New Orleans-based drama Treme. Again he plays a character that isn’t too much of a stretch; Harley Wyatt is a Manic Pixie Dream Street Musician, in the best possible sense. Earle doesn’t play anyone in the documentary Heartworn Highways, documentary, filmed in 1975 and ’76 by director James Szalapski, which captures Earle along with his old Texas cadre of Townes Van Zandt, Guy Clark, David Allan Coe, Rodney Crowell, and others, picking and singing in their element, on the cusp of greatness yet still wide-eyed and hungry. In 2011, Earle released I’ll Never Get Out Of This World Alive, an inspired album of odds and ends culled from various projects and slapped with a title swiped from one of his heroes, Hank Williams. But it was more than just an album; his debut novel, given the same title, was released concurrently with the album. As a work of fiction, I’ll Never Get Out Of This World Alive is erratic, but it’s also a captivating, magic-realist thriller haunted by the ghost of Williams—literally. It wasn’t Earle’s first book. In 2001, his short-story collection Doghouse Roses appeared, and the format suited his troubadour style much more harmoniously. And the overlap of characters between his prose and his songs shows just how much archetype and mythology Earle loves to work into his gruff, scruffy realism. He’s also at work on a memoir—most recently rumored for a summer 2015 publication—titled I Can’t Remember If We Said Goodbye. Who knows how good it will be, or if it will serve to magnify or dispel the legend that’s been built up around him. Knowing Earle, it might do both.